Hanoi (VNA) – Politburo member and permanent member of the Communist Party of Vietnam (CPV) Central Committee’s Secretariat Tran Quoc Vuong has affirmed that Vietnam will do its best to foster the Vietnam – Laos special relations in a wide range of areas, contributing to maintaining peace, stability, cooperation and development in the region and the world. During a reception in Hanoi on March 19 for Lao Deputy Defence Minister and head of the General Department of Politics Thongloi Silivong, Vuong congratulated Laos on its important achievements after three years of implementing the resolution adopted by the 10th National Party Congress. 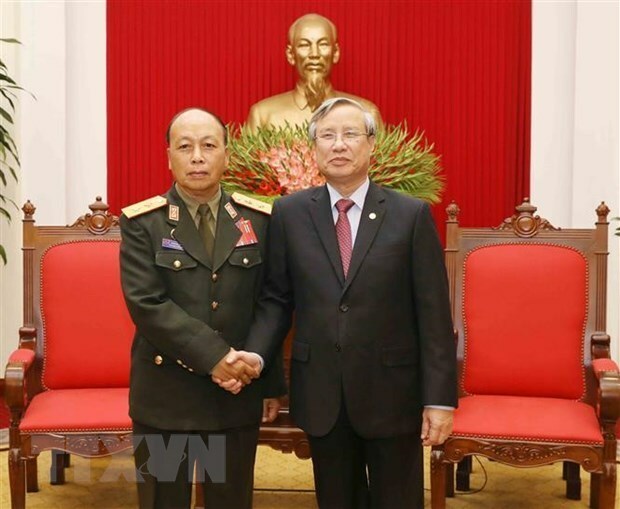 Speaking highly of the outcomes of bilateral cooperation between the two armies and talks between the two general departments of politics over the past years, Vuong said bilateral defence coordination deserves to be one of the pillars in Vietnam – Laos ties. He asked the two defence ministries to successfully fulfill assigned tasks and effectively carry out their cooperation plan, including maintaining political security and stability, social safety and order in each nation, effectively prevent and fight sabotage acts by hostile forces, especially the peace evolution along Vietnam – Laos borderline. The two ministries were urged to raise public awareness of the importance of the Vietnam – Laos special solidarity. Silivong, for his part, believed that under the leadership of the CPV, the Vietnamese people will reap greater achievements during reform process and successfully achieve goals set by the 12th National Party Congress.